Oceanfront Helicopters (formerly Huffman Helicopters) have been in business in Myrtle Beach for over forty years with a spotless safety record. They offer tours of the beautiful Grand Strand, where you will enjoy breathtaking sights only available from an altitude of seven hundred feet in the air (not to mention sights that few have the opportunity to see). Oceanfront's helicopters are maintained to the highest FAA standards, their pilots are commercially rated with many years of flight experience and their maintenance personnel are factory trained. All tours allow take you over the beach for an amazing view of the Grand Strand plus an opportunity to see exotic marine life in their native habitat including dolphins, sea turtles, bait fish, and, at times, sharks. Intro Flight: A quick, 2 mile trip to and from the beach with views of Myrtle Beach International Airport, Springmaid Pier, various resorts, two golf courses and more. North Beach Tour: Travel up the white sandy beach to the former site of the Myrtle Beach Pavilion. Fly by the new Myrtle Beach Boardwalk & Promenade as well as Family Kingdom Amusement Park (where you will see the legendary Swamp Fox wooden roller coaster). The North Beach Tour offers amazing views of the Grand Strand. South Beach Tour: The South Beach Tour begins with a fly by of vintage wartime aircraft in Warbird Park followed by a flight over Myrtle Beach State Park and its pristine, natural coastline. The South Beach Tour continues south over 3 campgrounds (Pirateland, Lakewood and Ocean Lakes) toward Surfside Beach. Broadway Tour: This popular tour flies along the coast and offers views of Myrtle Beach attractions including the Family Kingdom Amusement Park, Myrtle Beach SkyWheel & Promenade, Zipline Adventure and the Slingshot. The Broadway Tour stays along the coast, but you can look inland to see Broadway At The Beach off in the distance. Garden City Tour: The Garden City Tour begins with a fly by of vintage wartime aircraft in Warbird Park. The tour then travels down the coast to the south of Myrtle Beach, where you will fly by the Myrtle Beach State Park, beach piers, oceanfront campgrounds and more. Myrtle Beach Tour: One of our longer tours, the trip covers a long stretch of the beach which includes the renowned "Golden Mile" of historic mansions. The tour also offers magnificent views of popular oceanfront attractions in Myrtle Beach (Family Kingdom Amusement Park, Myrtle Beach SkyWheel & Promenade and more) as well as a myriad of oceanfront resorts. Apache Tour: The ultimate beach tour travels up to the Apache Pier and Restaurant Row in North Myrtle Beach. The Apache tour covers everything that the Myrtle Beach Tour covers (the "Golden Mile", oceanfront attractions & hotels) in addition to an extended beach flight. Inlet Tour: Our pilots favorite, the Inlet Tour offers breathtaking views of tidal marshes, estuaries, dunes and a myriad of native, inlet wildlife (birds, turtles & alligators). The long tour increases your chance of spotting ocean wildlife including dolphins or possibly a shark. A beautiful view of the mouth of the inlet caps off the tour. Grand Tour: Oceanfront Helicopter's longest tour includes everything from the Apache tour, this flight will also take you all the way up to Cherry Grove Pier, almost to North Carolina. You will fly by North Myrtle Beach, Cherry Grove and the Intracoastal Waterway. Tours range from $20 to $179.99. Call Huffman Helicopters at 843-946-0022 for info. Ready to make plans for your vacation along the Grand Strand of South Carolina? 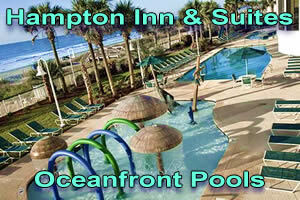 Check out these fantastic vacation deals on oceanfront Myrtle Beach hotels and condo rentals.